Follow the road from Vathy toward Marathia and at “Anemodouri” a large sign on the left side of the road shows the direction of the path to Arethousa Spring. Enter the path, which has a gradual downhill inclination, and go through a place which shows no signs of the presence of people. The slopes are full of low bushes and offer a wonderful view of the southeastern coast of Ithaca. The path, after five turns which pass through as many mountain ridges, will suddenly take you to a place which offers a breathtaking view! You are now in front of an impressive, steep rock, a huge geological rift where a spring with the Homeric name has been chiseled out at its base. It is where Eumaeus took his animals to drink (Odyssey v 407-8: : «…αι δε νέμονται παρ Κόρακος πέτρη επί τε κρήνη Αρεθούση»). According to the ancient tradition, Korax was an inhabitant of Ithaca, who, while hunting fell off a cliff and was killed. His mother, Arethousa, hung herself from grief next to a spring. That spring was named after her and was called “Arethousa Spring” and the steep rock was named after her son and was called “Korakos Petra” (Crow’s Rock). A few meters before the spring, the path to the left toward the sea leads to the wonderful beach “Pera Pigadi”. This is a wonderful route that leads to one of the most exceptional destinations in all of Ithaca. Follow the paved road from Vathy toward Marathia. On the Marathia plateau the information signs will inform you of the place where the path starts. Follow the signs on the path and walk for about 40 minutes from the plateau toward the side of the mountain where the area starts to become more difficult to walk through until you reach the small church of Panagia (Virgin Mary). You are now above “Antri”, the southernmost bay of Ithaca where you can enjoy the endless view of the Ionian from the coast of Lefkada to the bay of Patras. Here the old inhabitants of Ithaca, with simplicity and piety, closed the opening of a small cave by building the front wall of the church. The bell tower is built on the rock and in front of the church there is its yard and stone cistern. 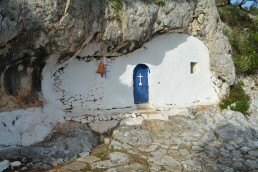 The church is called “Panagia at the Caves” or “Panagia Spiliotissa” and is commemorated to the Virgin Mary of Vlachernae. Every year on her feast day (2 July), at dawn, the people carry the icon of the Virgin Mary which is kept at the church of the Assumption of the Virgin Mary in Perahori over the whole path to this church so that the Holy Liturgy can begin. After the Holy Liturgy, the icon is returned to Perahori in the same way. Start at Vathy and take the road toward Marathia. A bit before “Anemodouri” (there is a sign), on the right side of the road you will see a blue information sign, and from here you will start toward the cave. The path is uphill, but it is at an easy inclination and quite a short distance. After about a 20 minute climb you will reach the cave. You can enter from a small opening in the rock and the impressively sized cave (for Ithaca’s standards) will open in front of you! 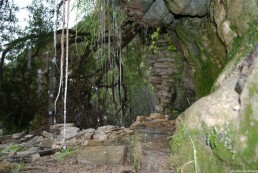 At the side of the ceiling of the cave there is a large opening from which an adequate amount of air and sunlight enter. At the bottom of that opening you will see an old fig tree. The cave is very spacious and that is the reason why in the past it was used to house animals. 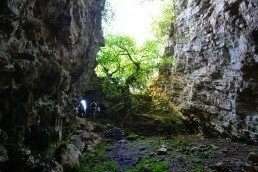 Researchers mention that it is the Homeric Cave of Eumaeus, Odysseus’ swineherd. This one of the most popular hiking routes of Ithaca. It connects the mountainous Anogi with the seaside Kioni, a village which was founded by the inhabitants of Anogi in the early 1800s, when the threat of pirates had diminished and which had forced the inhabitants to live high in the mountains for protection. Start from the village square in Anogi and follow the paved road toward the helipad. On the left side of the paved road, next to the last houses of the village, you can admire the very tall oaks (one of the three types of oak trees found on Ithaca) and a bit further down on the right a narrow byway will lead you to the impressive monolith called “Araklis” (8m tall). Return to the paved road toward the helipad. When you reach the fence of the helipad turn left and follow the red marks and start on the old road toward Kioni. You will cross the plateau of Anogi while on your left you can see the old stone windmills which once ground the wheat which was cultivated on the plateau. At approximately the middle of the way you will find a stone cistern. Next to the cistern there is a small iconostasis which marks the existence of a small ruined church a few meters away from the cistern. Further along the way the road becomes almost horizontal and goes through olive groves and vineyards. Near Kioni a dirt road cuts through the old road a few times. 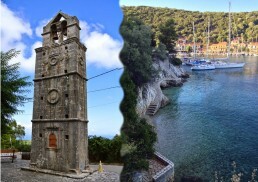 The route leads you to the beautiful small church of St. Gerasimos on the outskirts of the village and from there you can go down to the picturesque port of Kioni.